I’m re-blogging this article I wrote about four-and-a-half years ago, because of accusations today being aimed at Jeremy Corbyn that he has supposedly spoken up for Osama bin Laden. He went on to say that Osama Bin Laden should have been put on trial. Even Boris Johnson has said the same. The accusation is therefore a typical right wing media quote-mine. The reason for re-blogging is that, at the time, I thought the killing of bin Laden looked underhanded, suspicious, and unnecessary, and as Corbyn appears to be saying much the same thing, I think it is a good time to re-articulate the reasons why. You may notice my writing style was slightly different back then; in particular, I tended to use contractions a lot more, a bad habit I have made a conscious effort to iron out of my work in subsequent years. Heartbreaking, and as someone who used to live near Clydebank, reading it feels that little bit more real. NOTE: I nearly wrote this article back in June, but in the end I decided to wait until evidence was in the public domain of post-Work-Capability Assessment deaths. Seifeddine Rezgui is the name of a killer. On the 26th of June 2015, armed with a Kalashnikov, he attacked a hotel in Port El Kantaoui, on the north-east coast of Tunisia. His frenzied attack, committed on behalf of the extremist terror group, Islamic State of Iraq and Levant (ISIL), left thirty-eight people dead. Thirty of them were British citizens, whose memory was lovingly saluted three days later, when the House of Commons observed a minute’s silence. The Prime Minister, David Cameron, then ordered that a national minute of silence would be held on the 3rd of July, exactly one week after the attacks. 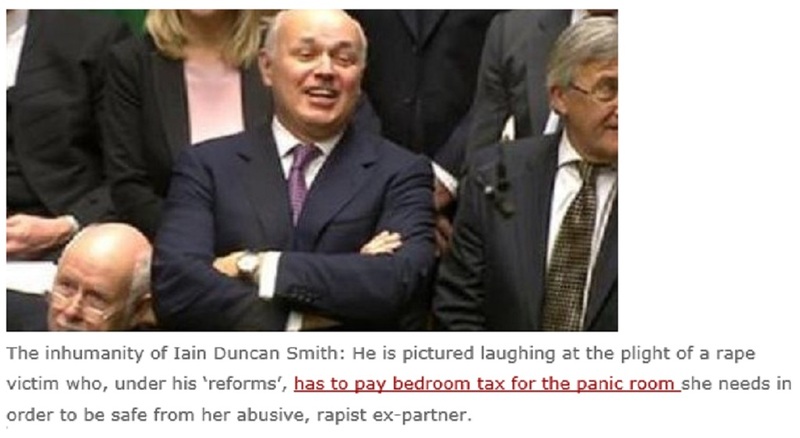 Iain Duncan-Smith is the name of a killer. Since becoming Secretary of State for Work & Pensions in May 2010, he has embarked on a program of haphazard, unnecessary, inefficient and myopic reforms that have led to the deaths of literally thousands of the country’s most vulnerable people. Many of those who have died were disabled or severely ill in ways of which he has no expert knowledge, but he has blundered on with his reforms regardless. Some of these reforms, ostensibly about saving money (which is apparently more worthy of saving than lives), have cost enormous amounts to implement, and are yet to show any positive return whatever. This week, on the 27th of August, the figures for the numbers of people who have died while claiming benefits were released by the Department of Work & Pensions. While the numbers must be treated with a measure of caution given that the precise cause-and-effect measurements are still unknown, the marked and profound acceleration in the death-rate – an upswing of some two hundred per cent in a little over two years – since Duncan-Smith arrived in office clearly indicates his work has had a disastrous impact on tens of thousands of people. The memory of those who have lost their lives to these reforms has not been lovingly saluted since the figures were released, and the House of Commons has not observed a minute’s silence. Having not held a minute’s silence in Parliament, the Prime Minister, David Cameron, then did not order that a national minute of silence would be held on the 3rd of September, exactly one week after the figures were released. Indeed, I can find no indication that Cameron has even spoken about the figures since their publication. I am not in any way trying to play down the tragedy of the massacre at Sousse, but it is clear that British priorities are warped; thirty British deaths are apparently worthy of calling the nation to a standstill for when they are the handiwork of a fanatical foreigner, but thousands of British deaths are not even worthy of a mention when they are the handiwork of a fanatical Minister. Duncan-Smith is clearly responsible for many, many times more British deaths than Rezgui, but it is Rezgui whom the British public are most likely to vilify. So it seems killing British citizens is only a matter for outrage when foreigners do it. When the British ruling class do it, it is a matter for shrugged shoulders. Parochialism and xenophobia have always been foolish frames-of-mind, but when they blind us to the crimes of ‘our own’, so to speak, they are also immensely dangerous, as they allow those in power to get away, almost literally, with murder. Thanks to all who helped force the DWP to reveal the truth. Now we must prepare for an even greater battle, to force a change of policy. This post is about the recent revelations from the DWP of just how many people have died shortly after having their benefits axed – revelations that were carefully timed to coincide with the dissolution honours in an effort to minimize the coverage they got. Having finally had to admit defeat after fighting a long rearguard action against making any revelations at all (well done Mr Sivier and Ms Zolobajluk for your roles in making this happen) they produce the figures at this time of all times! Arguments could be made – indeed have been made – that the deaths cannot be reliably confirmed as caused by the DWP’s policies, as the cause-of-death in each case has not been recorded. But the astonishing rate-of-acceleration among the deaths since 2011 leaves little room for doubt; DWP policies, as they have kicked in, have clearly had a very substantial impact, and one for the worse. If the acceleration were caused by something else, for instance the recession, why did the death-rate not start accelerating a couple of years earlier, and why has it not slowed down again over the two years since the so-called ‘economic recovery‘ began? The figures, in the end, are only numbers and so I suspect many people will take a while to grasp their full significance. Trying to imagine ninety-two thousand faces, and trying to assign a name to each one, is perhaps the only way of turning a number into humanity. But for over ninety thousand people? That would take a very long time. That is the point. So often in recent times, when challenged on the heartless cruelty of his Sanctions Regime, the Work & Pensions Secretary, Iain Duncan-Smith, has offered only pseudo-religious platitudes of, “I am doing what I believe to be right” or some variation. How can this possibly be ‘right’? How can he possibly carry on insisting that he is doing people good when thousands of them are literally dying as a direct result of his malevolence? Duncan-Smith’s conduct towards the unemployed and the disabled while he has been in office has often been described as ‘bullying‘, but is that really an adequate word? He is not just reducing people to tears, he is not just imposing his will on them in an unfair and intimidating way, he is not just making them feel small. He is killing them, he knows that is the consequence of his deeds, and he carries on doing them, usually looking for more and more people to victimise by cutting away more and more lifelines. That is not bullying, it is not even persecution, it is a blood-vendetta. It says a lot about Duncan-Smith’s priorities, and those of many in the wider public, that the rapidly-increasing rate of deaths among Britain’s most vulnerable people is likely to be seen in many quarters as a ‘price-worth-paying’, in the fight against ‘sponging’. Even if benefit fraud were really as prevalent as many imagine – in reality it is less than one per cent of the bill and has been around that level for a very long time – is culling people really ‘better’ than wasting money? Never mind that it is a false economy anyway as no net money is being saved as a result of all this, but how sick must our culture be when it has come to believe equations like that? EDIT 28-8-2015: Correction – the number of people who died after being categorised as ‘fit-to-work’ is two thousand six hundred-and-fifty. The four thousand figure is taken from several media sources who counted a number of the claimants twice due to a misunderstanding of two groups of statistics. The real figure is substantially fewer, thankfully, but still terrifyingly high, and while it does not rival the death-toll at Marston Moor after all, it is still high enough for the Battle Of Bosworth Field nearly three times over. With the Welfare State now all-but breathing its last, the pompous cliche about ‘benefits as a lifestyle-choice’ has become obsolete, and so it requires amending to something that is even more conspicuously stupid and cruel. 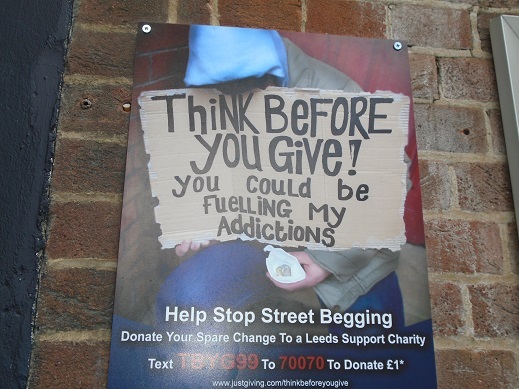 Leeds City Council have teamed up with the police and so-called charities, to come up with the nastiest campaign yet aimed at discouraging the public from giving a bit of spare change to homeless people. The above poster has been placed at key sites across the city warning people not to give money to beggars because it may help fuel their addictions. As ever the homelessness industry demands that people give the money to them instead so they can spend it on drink soaked conferences in posh hotels that cost £700 quid a ticket.